Kicker isn’t all that well known of a headphone brand, but a quick Google search will show you that the company has been making headphones for at least a few years now — with mixed results. Its latest offering, the Kicker CushBT headphones, aim to modernize the Kicker listening experience with support for features like Siri and Google Assistant. But at $150, these aren’t cheap headphones — and there are plenty of alternatives. Are they worth the cash? Read on to find out. When you first take the Kicker CushBT headphones out of the box, you’ll notice their design, and they’re nice-looking headphones. They feature an all-black color scheme, but they don’t look overly boring, which is always helpful. The headphones have a lot going on when it comes to build quality. They’re largely built from plastic, but it’s not a low-quality plastic, which is nice. There seems to be a good amount of padding both under the headband and on the ear cups, though the padding is a standard cheap foam rather than the memory foam many other companies adopt. Then, on the outside of each ear cup, there’s a kind of faux leather, which helps make the headphones look a little more premium. The left ear cup is relatively plan, but the right ear cup features a central button, which is the Kicker logo, plus you’ll see volume controls and playback controls around the logo. Usually, we prefer switches on the bottom of the ear cups to buttons on the side, but these don’t look bad, and they’re relatively easy to use, which is nice. You’ll also get an aux port. On the bottom of the left ear cup, you’ll find a MicroUSB port, which we were disappointed to see. It’s time to adopt USB-C in headphones. Thankfully, the headphones are relatively portable too. They fold up decently, and they come with a carry bag, which is nice. We would have liked a hard case, of course, but a bag still isn’t bad at all. Overall, we quite like the design of the Kicker CushBT headphones. They look nice, and feel nice too — plus they boast a good number of features. When we first put the headphones on, we were a little worried about their comfort-level. After all, the ear cups don’t swivel, and they don’t extend as far as some might like. Ultimately, however, we found that they weren’t too uncomfortable at all, especially for shorter listening periods. The clamp of the headphones was decently tight, but not too tight, and the padding, while cheap, seemed to be soft enough for most situations. Don’t get us wrong, the Kicker CushBT headphones aren’t the most comfortable we’ve ever tried, but they’re perfectly adequate. Of course, when it comes to headphones the sound quality is the most important thing to consider, and these don’t sound bad at all. They’re not the next Sennheisers, but they’re really quite nice-sounding headphones. One thing that Kicker headphones have struggles with in the past is their bass response, but that doesn’t seem to be an issue for the Kicker CushBT headphones. Bass is deep and powerful, offering plenty of punch for kick drums and a solid bass tone. If anything, we would say there’s too much bass — it seems to overshadow other frequency ranges a little. But some people prefer extended bass, and those people will be happy with what’s on offer here. The mid range, as mentioned, is a bit overshadowed by the bass, but it still sounds pretty good. The low miss are relatively warm, and the high mids offer enough cut for vocals and guitars to shine through a mix nicely. The worst aspect of these headphones is the high end response. There certainly are highs, but the headphones aren’t especially clear or detailed, and at higher volumes we found that the highs tended to distort easily. Most average listeners may not notice the distortion as much, but if anything it proves that these headphones are not built for audiophiles by any means. Overall, the Kicker CushBT headphones sound find, but there’s nothing too special about their sound quality. If you like heavy bass and don’t care about high end, these might do perfectly fine for you. 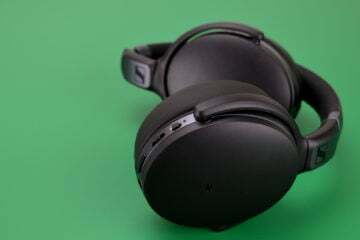 The Kicker CushBT headphones connect to your listening device through an unspecified version of Bluetooth, and as such you’ll get a listening range of around 10 meters, or 33 feet. We found that they did fine at retaining a connection through testing. When it comes to battery life, the headphones do more than fine — they’ll get up to a hefty 20 hours, which is really quite nice. The Kicker CushBT headphones have a lot going for them. They’re decently designed, pretty comfortable (with a few quirks) and have solid bass response. Their price, however, lets them down. $150 is a lot of money to spend on a pair of headphones that are good but not great. So what should you get instead? Well, you could go for the high-tech Even H3 headphones, which come in at the same price but sound a whole lot better, or you could save some cash and go for the $70 Audio Technica ATH-S200BT headphones — which are better headphones in almost every way. Still, considering their decent design and build quality, we’re awarding the Kicker CushBT headphones the Headphone Review Bronze Medal. You can get the Kicker CushBT headphones straight from Amazon.